I'm at it again here with a new Class 2 build. This one has a very special body coming in for it, although still a JK 2dr Hardbody. This time with no fenders attached, and properly pro-painted. I'm building up a nice steel cage system and special tube work for the fenders and stuff, so I'm looking forward to the build! 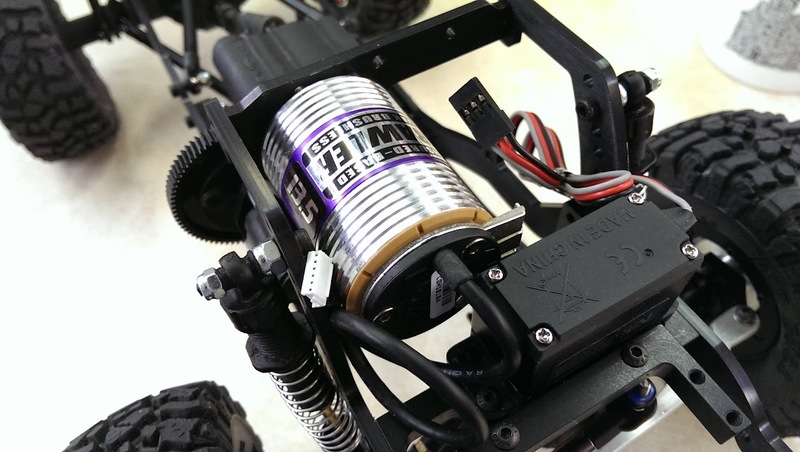 First off is a Skeleton J2 Ultimate Combo, coil springs, and a brushless 13.5t Novak, and I'm going to try the LT4 brushless esc from Brushless Hobbies. Is it a "bit" yet? I'm waiting. Here's some.. finally for y'all who are watching. 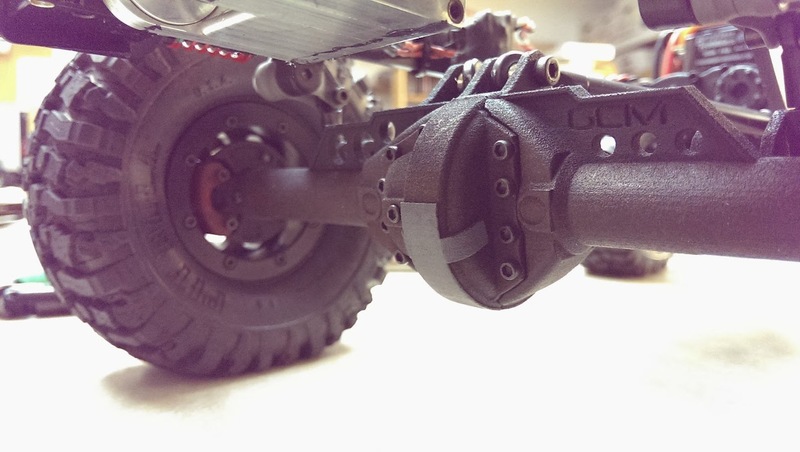 So, I'm going to use this as a test pig for my new Hi/Lo Transfer case, and it sits on a DropSkid sorta like the SCX center skid that also holds the lower links. I made up a solid steel half breed center driveshaft out of boat parts and plane landing gear spring steel shaft. Easy, but may not hang on to all this power. 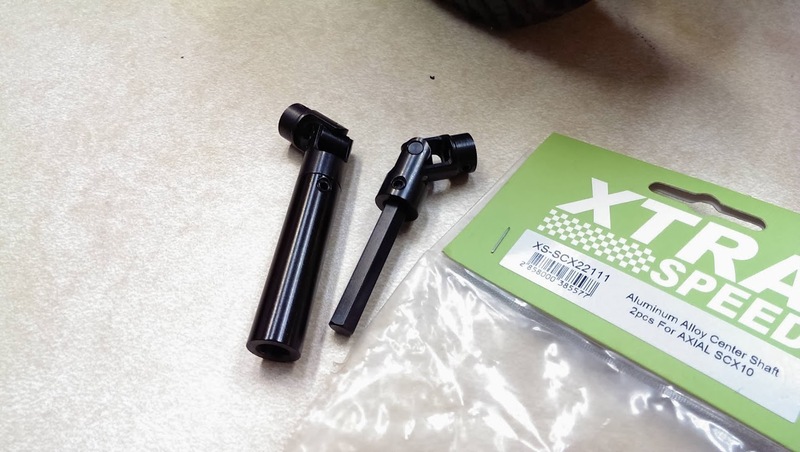 Now, (below) THIS is a driveshaft... and it's super cool because it's got a solid hex inner and outer part, so you can shorten it super easily and get a solid shaft after cutting. And it's got all steel universals. Nice. I'm going to use these on the axle drive shafts and may also use one for the trans shaft if the other one fails. Here's a side view. 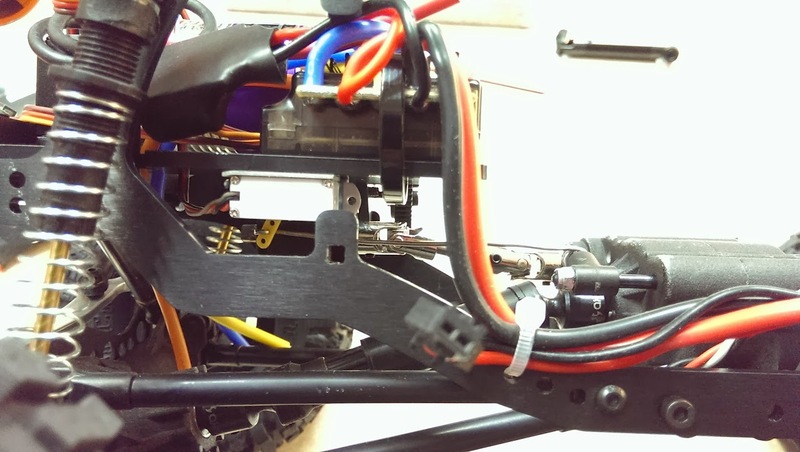 The simple little 5gram digital metal gear servo (tiny) is sticky taped to the bottom of the electronics tray, opposite the ESC. This thing is great for a couple of reasons. First, it's got well enough power to easily shift the Tcase, but.. it's not big at all. It's barely an inch wide. Much love. And it won't rip off with proper industrial sticky tape, which I used. 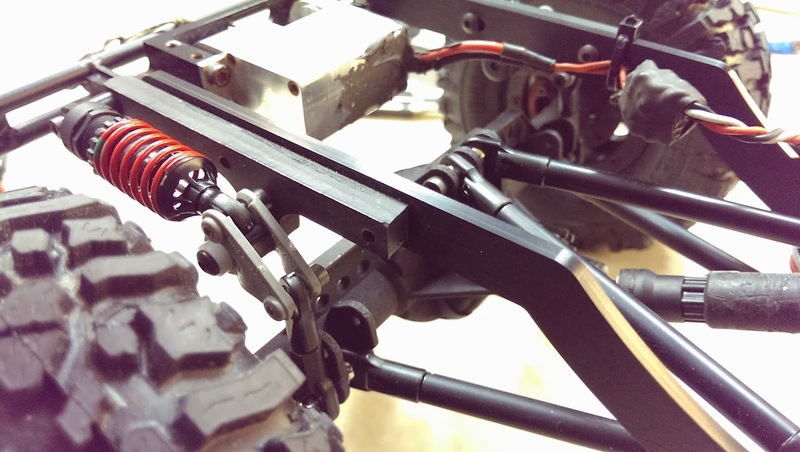 You can also see the little yellow servo horn there and the solid steel wire I bent up as a control rod. Here's an other view of the control rod at the Tcase end. 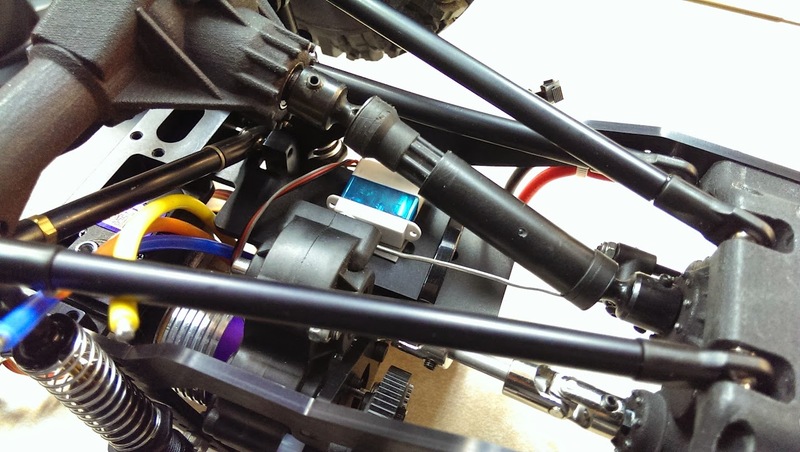 It's so easy.. just a Z bend at the servo horn and a coil wrapped around the bolt at the shift lever. Done. And it works great! 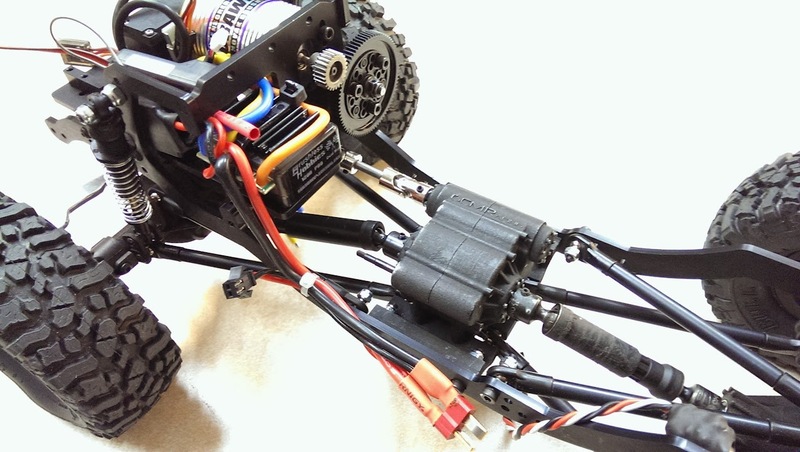 I'm using the Dinky R/C SCX cantilever rear suspension on this one, as well as the GCM Prototype axle housings. 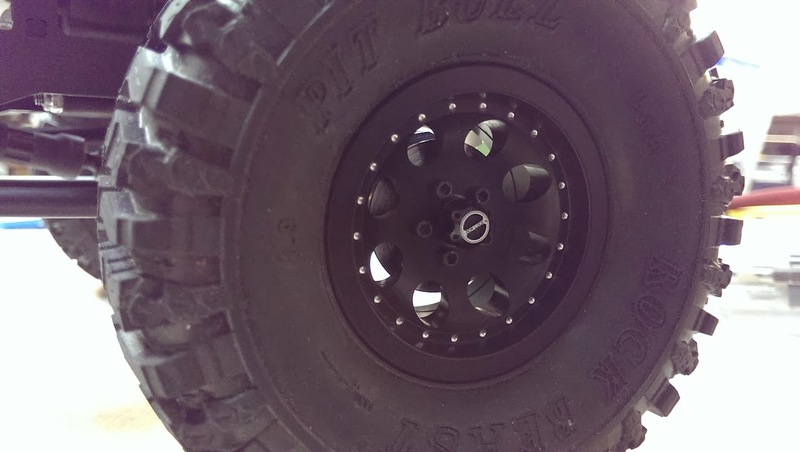 I also installed the new GCM Black LOCK hub set on the Baja 1.9 Black wheels. And PitBull tires. It's coming along quickly now. Agreed. Need to know more about those shafts. Perfect for just about all my trucks. I'm pretty sure I got those at rcmart. I will have to reduce them for this build. For sure. This Tcase is thicker than normal and needs a short shaft. 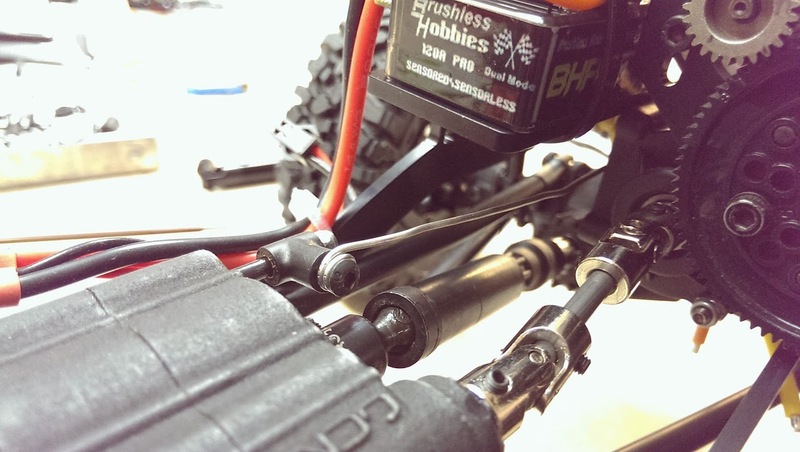 These guys are talking about driveshafts, while those new axles and hi/lo t-case are sitting there? Ha. Awesome stuff Chris, so cool youre creating these things man. Congrats on the determination and passion bud. All the stuffs looking great. Thanks, Rick! I'm really enjoying new development. That and the scale garage stuff is my favorite part! Looks excellent man. So much info to use when I FINNALY will get mine!